I hate it when people go on about how film adaptations spoil their favourite book. Don’t watch it and shut up. No-one likes a pedant. But first let me go on about this one point. It’s okay, it’s acceptable going-on, because it’s the worst piece of casting in literary adaptation history. A.S. Byatt’s Possession describes literary scholar Roland Mitchell as shy and awkward. His nickname is Mole. Let me repeat that he is a literary scholar. And he is shy and mole-like. Now no-one likes typecasting or stereotypes. No-one would insist that literary scholars all look shy and awkward, but it is crucial to this story that he is. Whatever the case, has anyone ever pictured a literary scholar to look like this? Like a big chinned Hollywood star? Obviously some movie producer did. He read the script which described a shy, awkward literary scholar with a nickname of ‘Mole’ and the first name which came into his mind was Steven Segal. But Steven being unavailable, the next name that came into his head was Aaron Eckhart (whom I have nothing personal against). And so Eckhart became Roland Mitchell, with predictable results. I found Possession an engrossing novel. It is the story of two contemporary literary scholars – Roland Mitchell and Maud Bailey – who discover a secret affair between two (fictional) nineteenth century poets – Randolph Ash and Christobel LaMotte. The scholarly world is captured with all its interesting intrigues. At one level, the novel’s title refers to questions of ownership over history and historical figures and their traces. The theme is illuminated by Roland Mitchell’s initial act of theft of a draft of a letter from Ash to LaMotte when he discovers it in a book Ash once owned. Mitchell feels it’s his discovery and he should ‘possess’ it; a feeling intensified as he enlists Maud’s help and they find themselves on the run from other Randolph Ash scholars, including the American collector Mortimer Cropper whose massive cheque-book allows him to ‘possess’ many Ash relics. The word ‘possession’ also sums up the exploration of romance and relationships. In both the nineteenth century affair between Ash and LaMotte and the contemporary one between Roland and Maud, the lovers struggle with the nature of love. Is it about possessing the other? The nineteenth century narrative is created purely through documents (with the exception of the epilogue) – including letters written by the lovers, diaries by their respective partners (Ash’s wife, LaMotte’s lesbian partner), and pages and pages of their poems. The poems read just like nineteenth century poems; an incredible achievement. But they bored me and I skipped over pages of them – I wanted to read a novel, not poems! The film version of Possession takes just 98 minutes to adapt a 511 page novel. It is both a simplification and a ‘greatest hits’ collection of scenes that on its own – without knowledge of the novel – lacks emotional power and significance. Trying to develop two parallel romances in different centuries in that short amount of time is impossible, and the film makers barely even try – Maud and Roland, the present day lovers, are reduced to one awkward encounter and then discussion of it. The thriller element of the novel, with different parties pursuing the secret of Ash and LaMotte is only lightly used in the film, a strange decision given its cinematic potential. The film-makers do use the dramatic grave robbing climax, but in a truncated and disappointing scene which doesn’t make much sense. Roland Mitchell wrestles the box from Cropper and takes it away to look at it with Maud, no more ethical than Cropper himself. The most disconcerting aspect of the film is the casting of big jawed hunk Aaron Eckhart as the supposedly shy and bookish unemployed scholar Roland Mitchell. 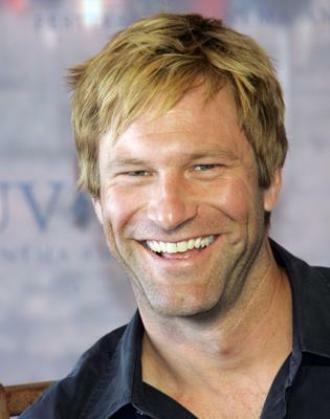 In the book his girlfriend calls him ‘Mole’, a name no-one would apply to Aaron Eckhart’s character. Probably to appeal to the American audience, he has also become American, when his Englishness was so central to his character in the novel.